KOKOMO, Ind. – For the first time since 2001, the Kokomo Post 6 baseball team will return to the Indiana American Legion State Finals after cruising through the four-team Indiana Regional No. 3 at Centerville High School. The Sixers (26-5) will play for its third Indiana state championship this week at Bill Nixon Field in Plymouth. 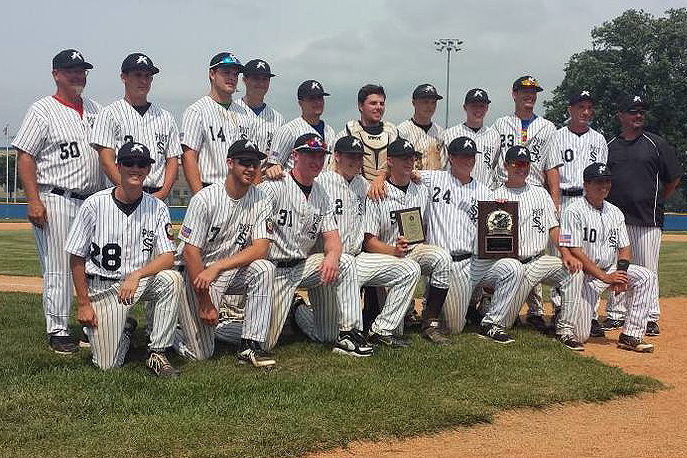 The Sixers advances to the state finals following a 12-5 win over Richmond Post 65 in the title clash. Drew Bellus picked up the win, throwing five-hit ball through the first six innings. Justin Blevens led the offensive attack with a pair of singles, a home run and five RBIs. Keagan Downey nearly hit for the cycle, ending with a single, double and a triple. Nathan Pflugh popped two singles and a double while S.A. Dunn and Isaac Turner each had two singles. Post 6 opened regional play with an 11-2 win over Cicero Post 34, thanks to a solid pitching performance by Austin Weaver, who improved to 8-0 on the season. Weaver struck out six in six innings of work and gave up just one earned run. Dunn had three singles and a double to pace the hit parade. Logan Macaluso and Pflugh had two singles each and Downey had a double. Evan Warden and Blevens each had a two-run single. Game two saw Kokomo knocked off Richmond 9-1 as Warden struck out 11 hitters in six innings of shutout work to record the win. Macaluso had two singles and a triple, Tyler Goudy and Isaac Turner had a single and double each and Downey knocked in a pair of runs. Kokomo (state championships in 1972, 1976 and 1982) will open its bid for a fourth state title in the final game of opening day on July 29 when it plays host Plymouth Post 27 at 7:30 p.m. Rockport Post 254 plays Remington Post 280 in the tourney opener at 9:30 a.m. Game two features Mishawaka Post 161 against Newburgh Post 44 at 12:30 p.m. while Floyds Knob Post 42 will battle perineal favorite and 12-time state champion Terre Haute Post 346 at 4:30 p.m. The winner of the Indiana state finals will travel to the eight-team Great Lakes Regional in Terre Haute the following week. Terre Haute receives an automatic bid to the regional, so if they win the state title the runner-up team would advance.